It’s hard to imagine a more photogenic place than the Eternal City. There are endless pretty piazzas, narrow streets, castles, palaces, and neighborhoods that make up the most instagrammable places in Rome–and that’s before you even start to catalog the many ways to photograph iconic sights like the Colosseum. Planning a trip to Rome and want to make sure you find all the most Instagrammable spots? Here’s where to look. How could a guide to the most instagrammable places in Rome start with anything but the Colosseum? An icon of Rome, the Colosseum deserves to be photographed from all angles–here are a few of our favorites. As you exit the Colosseo metro stop, turn left and then climb the steps that will be on your left as you stroll along the north side of the Colosseum (but the steps are on the opposite side of the street, of course). This is where you’ll find that perfect perch to take endless photos with the Colosseum’s exterior! When you’ve already entered the Roman Forum, turn and head back toward the Colosseum, all the way past the Temple of Venus and Roma. You’ll be greeted with an absolutely picture-perfect view of the Colosseum, with far fewer crowds than if you tried to take this photo from the same angle outside the forum. Honestly, the interior of the Colosseum isn’t quite as photogenic as the exterior–but you can still get some beautiful shots inside if you’re willing to be patient! If you’d like to get some photos of Arch of Constantine, you can get some lovely ones looking down at it from inside the Colosseum as well. Located right next door to the Colosseum, the Roman Forum is full of Instagrammable spots. Our favorite place to snap photos, though, is the terrace on Palatine Hill that overlooks the forum. 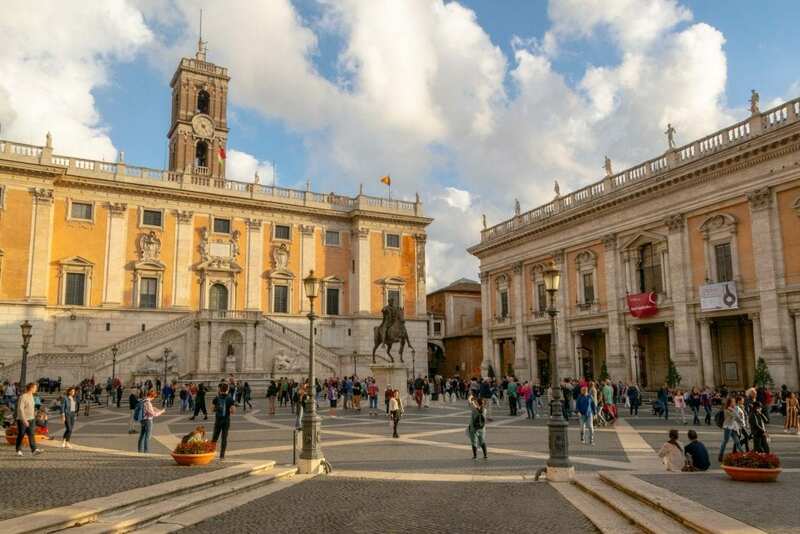 Designed by Michelangelo, this piazza is one of the prettiest in Rome! St. Peter’s Square (not to mention the basilica itself) is an absolutely iconic photo spot, and absolutely deserves to be counted among the most instagrammable places in Rome. Here’s where to get a few of our favorite angles on it! Trying to get a photo of the piazza from the ground level, basilica, fountain, and all, is a little tricky given the severe crowds–this is definitely a spot worth waking up early for if you want a photo alone here, but it is beautiful! 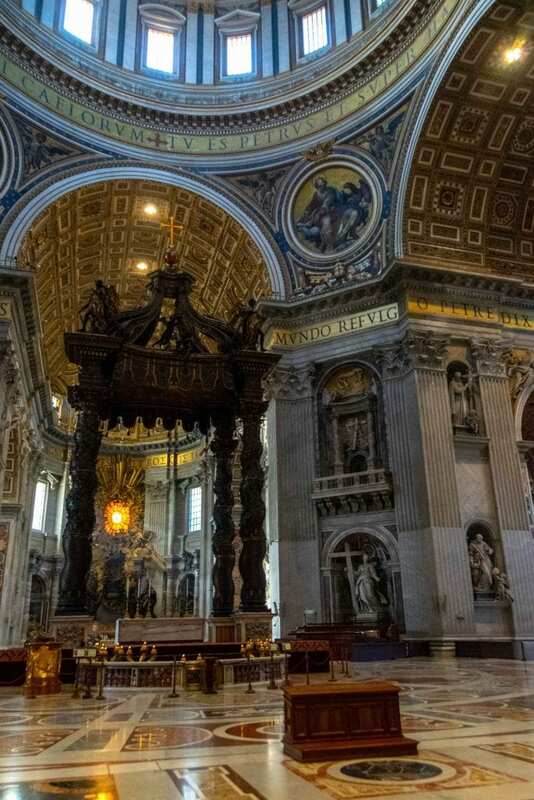 The interior of St. Peter’s Basilica is gilded and unforgettable–and it makes for absolutely stunning photos. 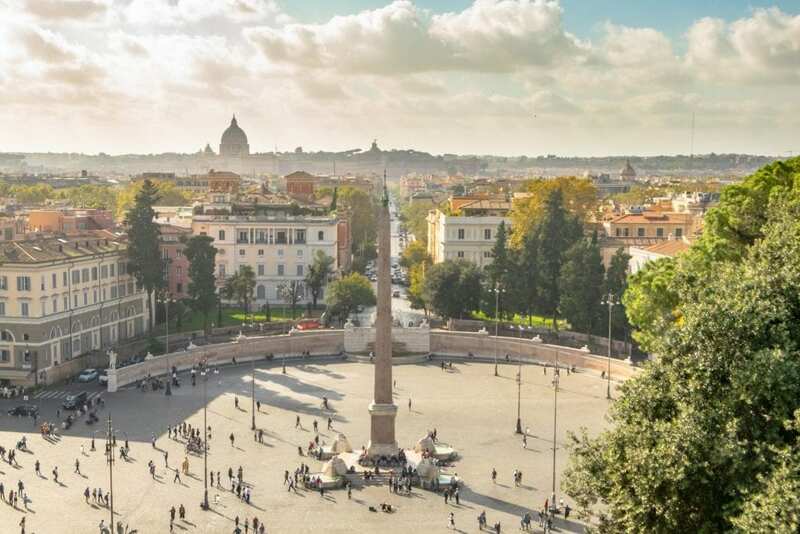 If you want to get the ultimate Instagram photo of St. Peter’s Square, you need to climb (and leave your claustrophobia on the ground–this climb isn’t for those who don’t like tight spaces). 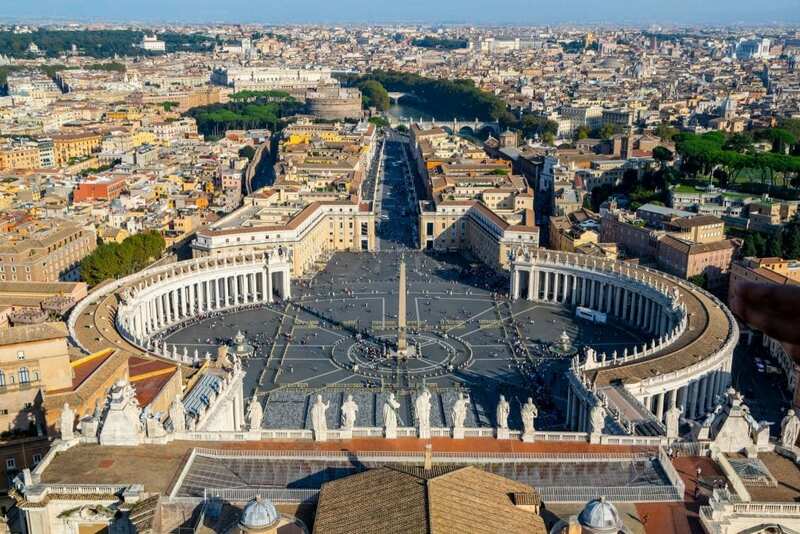 Ascending to the top of St. Peter’s Basilica is where you find this iconic photo of the piazza, which is arguably one of the most famous photo spots in Rome! The Castel Sant’Angelo has a distinct look to it–it’s not everyone’s style, to be honest–but this mausoleum-turned-icon is definitely one of the most well-known photo spots in Rome. Here are a few of the best angles to get great photos of it! Ponte Sant’Angelo is lined with large, beautiful statues of angels and dead-ends right into Castel Sant’Angelo–if you want the popular shot of you standing on Ponte Sant’Angelo in front of Castel Sant’Angelo with no other people around, definitely show up very early! 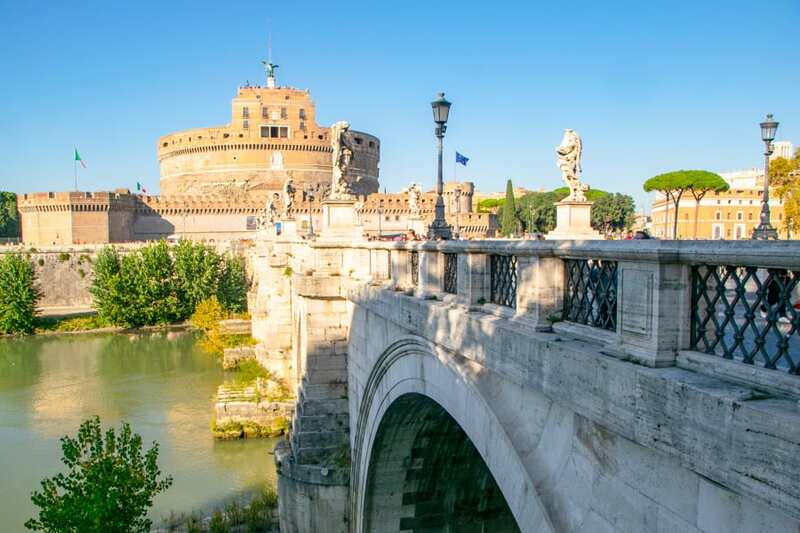 If you climb down to the banks of the Tiber (you can find steps down next to either the Ponte Sant’Angelo or Ponte Umberto), you can catch a classic view of the Castel Sant’Angelo–just please, for goodness sake, do not sit down on those banks. They are disgusting and smell like urine, and I cringe every time I see someone on Instagram sitting down there! From Ponte Umberto, you can snap beautiful photos that show the Castel Sant’Angelo, Ponte Sant’Angelo, and the dome of St. Peter’s Basilica together in one shot! Home to the Pantheon, Piazza della Rotonda definitely belongs on any list of the most instagrammable places in Rome! 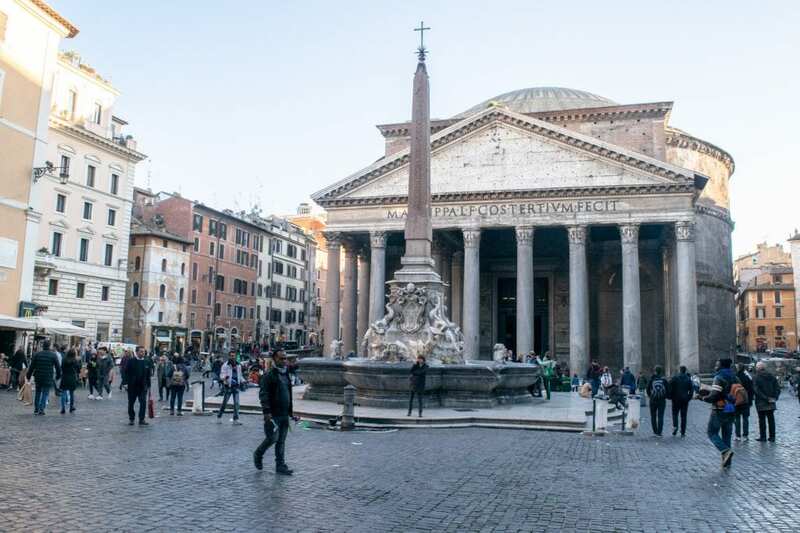 Be sure to get shots of both the front of the Pantheon alone and of the Pantheon with the beautiful Fontana del Pantheon in front of it! Rome’s Orange Garden is stunning, and from here you can get great Instagram photos of both the Roman skyline and of the garden itself, which is incredibly photogenic. 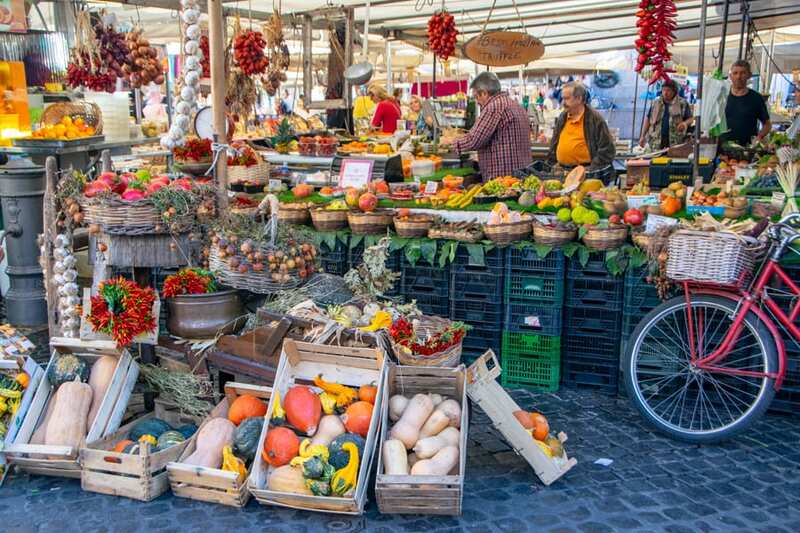 Home to one of the most popular outdoor markets in Rome, this is the perfect place to get those Rome Instagram shots of beautiful fruits, vegetables, flowers, olives, wines, and more. The market is a bit touristy, yes, but that’s part of what makes it so photogenic–the vendors definitely play into visitor’s love of taking photos! 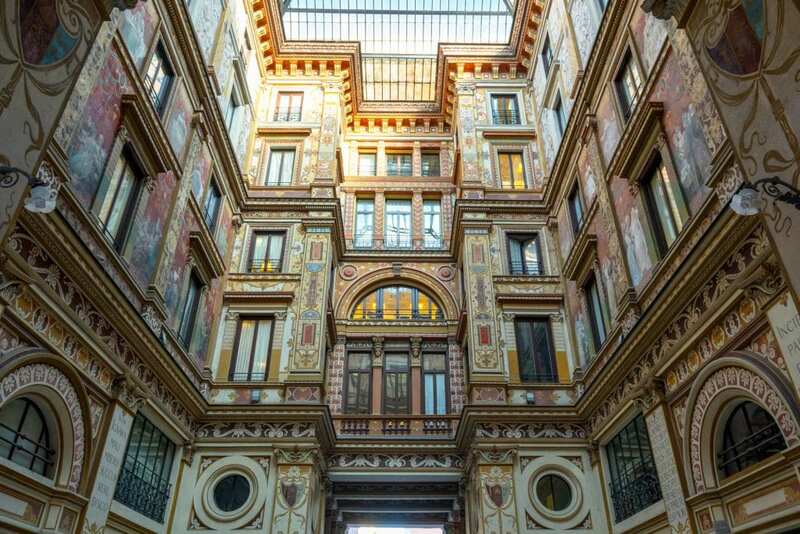 Surprisingly empty considering its location just a 15-minute walk away from the Colosseum, the Galleria Doria Pamphilj enclosed within this palace is easily among the most instagrammable places in Rome, and yet it still remains delightfully under the radar. 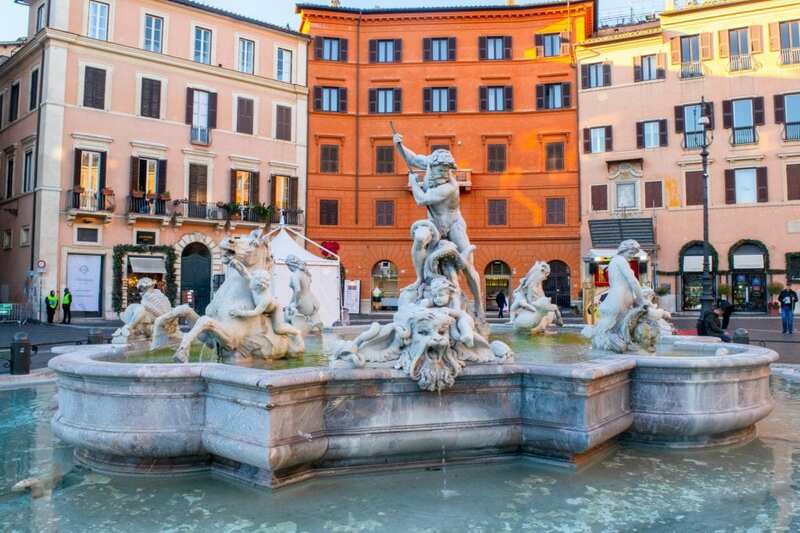 Popular Piazza Navona is dominated by three gorgeous fountains and lined with colorful buildings that have boxes of flowers spilling out of their windows, and is one of the most classic photo spots in Rome. Definitely arrive early (or in off-season) if you want to take Instagram photos with one of the fountains by yourself! No list of instagrammable spots in Rome could be complete without mentioning the Trevi Fountain: stunningly gorgeous and nearly constantly crowded, snapping photos here is as challenging as it is rewarding. 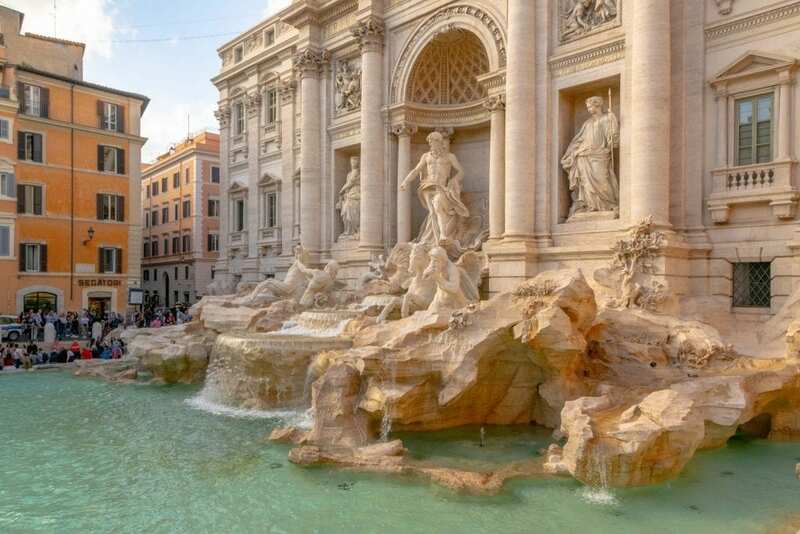 If you want photos of you frolicking alone with the Trevi Fountain, definitely show up around dawn–otherwise, if you squeeze your way to the front to toss in a coin, it is sometimes possible to get great close-up photos of the fountain. 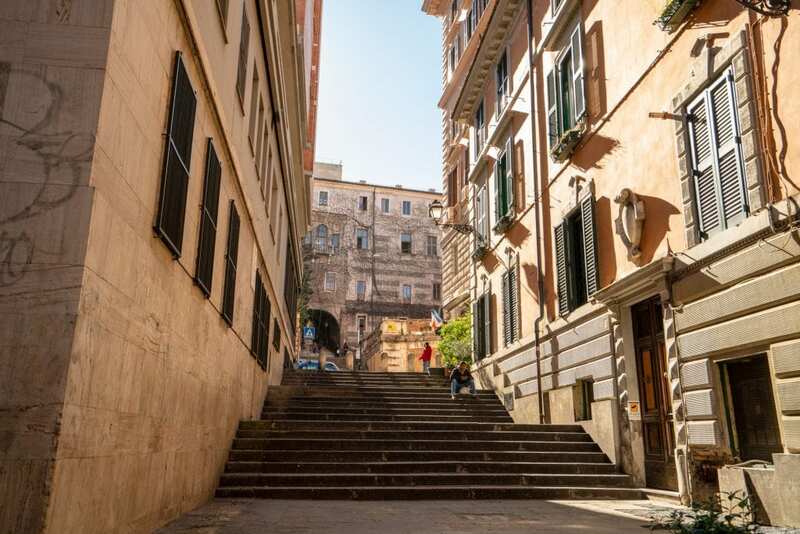 The Spanish Steps are beautiful from all angles–here are three of the best spots to get great photos of them! Standing in Piazza di Spagna, you can easily get the classic shot of the Spanish Steps looking up. Located at the top of the Spanish Steps, you can capture beautiful photos here looking down at the steps–or out at the Roman skyline. 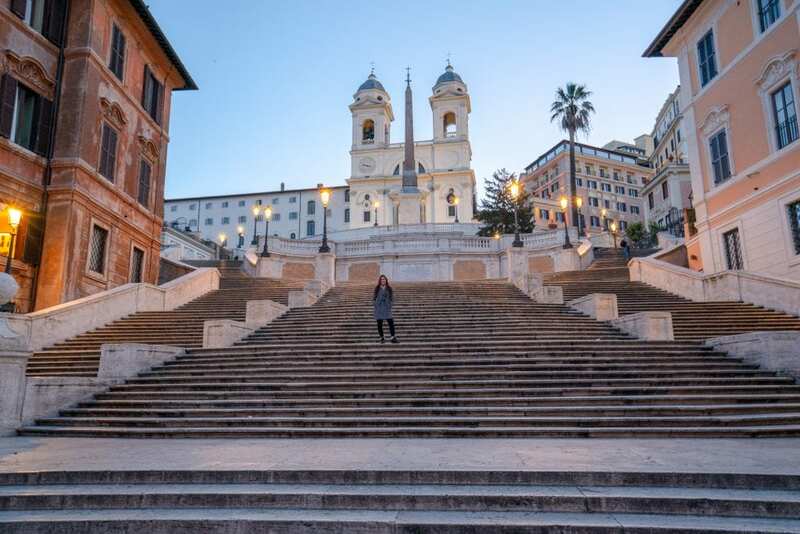 Want to get a fabulous Instagram photo of the Spanish Steps from an angle that you haven’t seen 1000 times? The windows in the library at the Keats-Shelley Memorial House boast an incredible and unique view of the steps (and the windows in Keats’ bedroom have a fabulous view overlooking Piazza di Spagna). There is no better spot to capture fabulous Instagram photos of the Piazza del Popolo than from the lovely Pincio Terrace! The Altare della Patria dominates the landscape of Piazza Venezia, and while the Piazza itself isn’t among the most instagrammable spots in Rome (too many cars! ), the enormous monument sure is. Want to grab sunset shots over Rome’s wide cityscape? 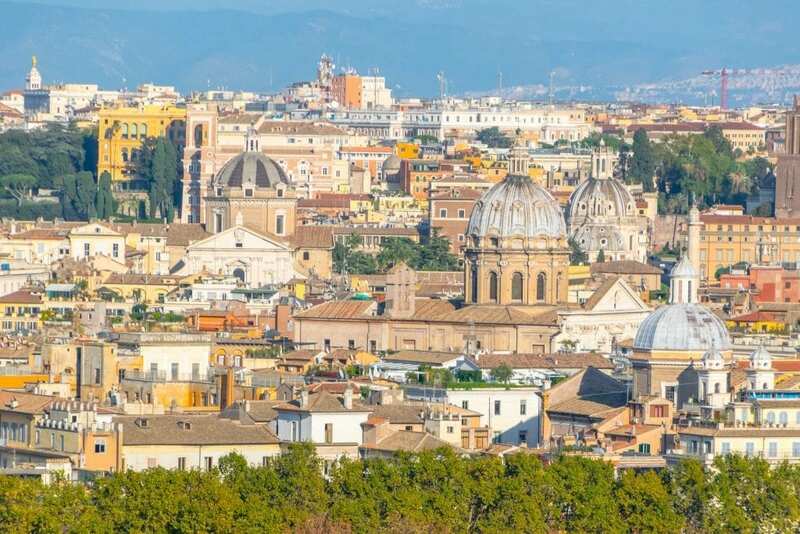 The summit of Janiculum Hill is the place for you! Peer through the tiny Aventine Keyhole (and yes, it is a literal keyhole! ), and you’ll come face-to-face with an incredible sight: the dome of St. Peter’s Basilica, perfectly framed by hedges. It’s definitely a photo op unique to Rome! Want to visit incredibly beautiful frescoes by Raphael and photograph them without the severe crowds that plague the Vatican Museums? 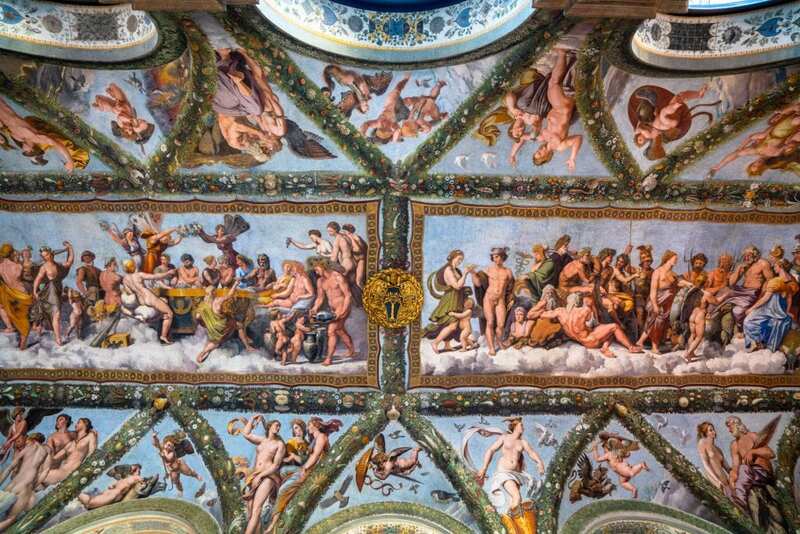 Villa Farnesina is only a short walk away from the museums, nearly deserted by comparison, and is home to stunning frescoes by Raphael that are flooded with natural light–and what could be more instagrammable than that? Located only a few minutes from the Trevi Fountain and free to visit, this stunning Art Deco courtyard definitely belongs on any list of the most Instagrammable places in Rome–and odds are that you’ll be practically alone when photographing it! 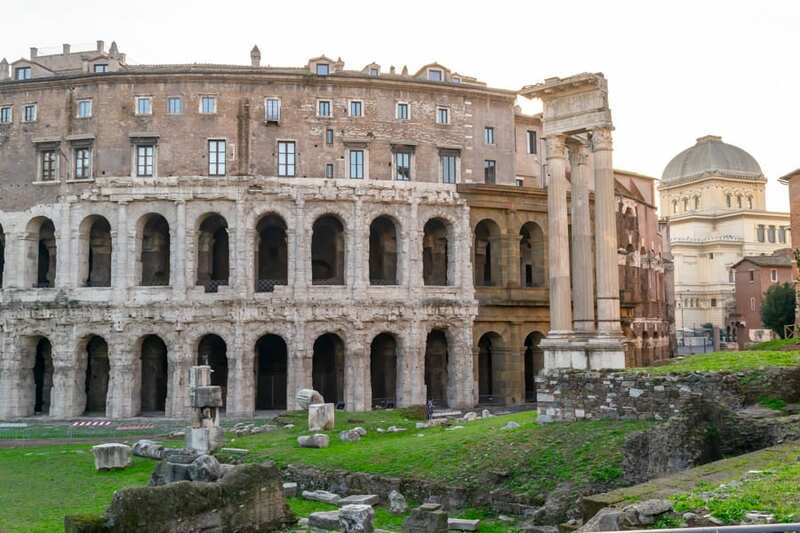 Less famous–and therefore less crowded–than the Colosseum, Teatro Marcello is the perfect place to snap beautiful Instagram-worthy photos of Ancient Roman ruins without having to battle (as many) crowds as in more popular spots). 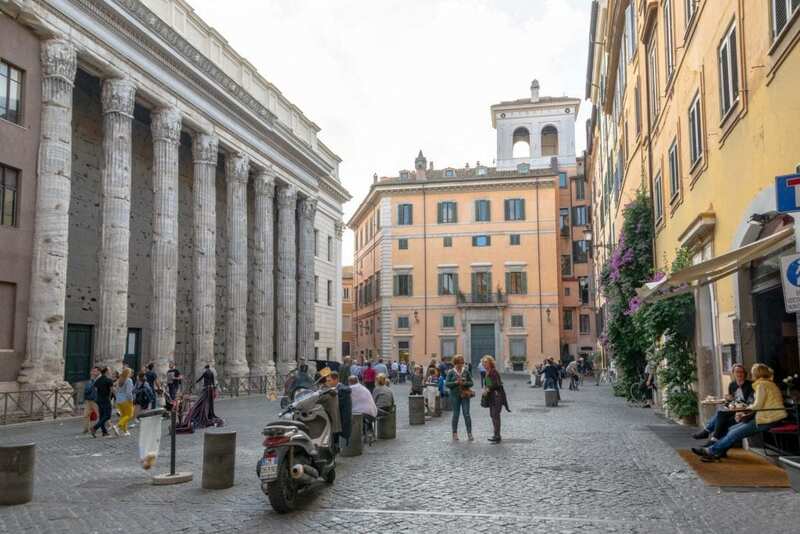 With columns belonging to the Temple of Hadrian lining one side of the street and colorful buildings housing adorable cafes on the other, it’s hard to imagine a spot that is better to capture the blend of ancient and modern Rome than Piazza di Pietra. 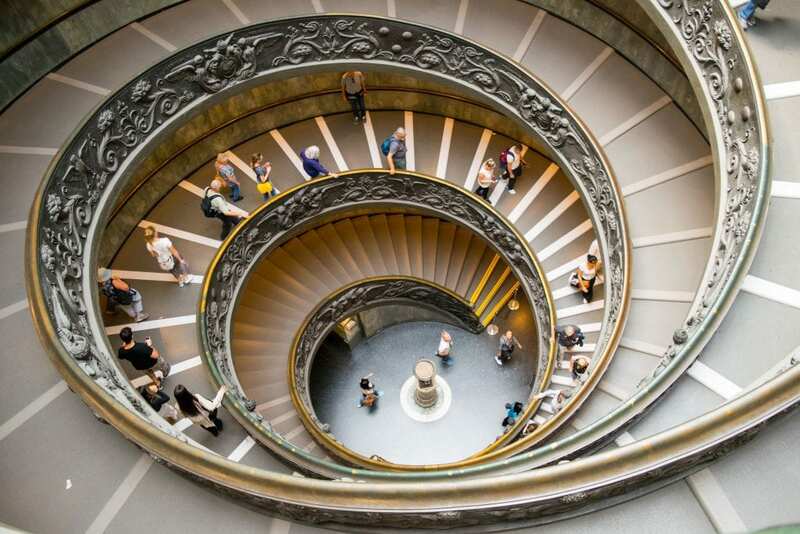 This is the famous double-helix staircase in the Vatican Museums, and it is definitely photogenic! Just be aware that you only happen across this staircase as you’re leaving the museums, so you won’t see it until the end of your visit. Also, though it isn’t directly related, since we’re talking about the Vatican Museums, I’ll go ahead and mention that photography is forbidden in the Sistine Chapel, so Michelangelo’s masterpiece isn’t going to end up as one of your Instagram photos from Rome! Much like Trastevere, the winding cobblestone streets of Centro Storico (and I’m using that definition a bit broadly here) are covered in hidden and not-so-hidden photographic gems. A few spots to keep an eye out for? Via Margutta, Via dei Coronari, and the tiny-but-lovely Via di San Simone, where I snapped this Instagram photo in Rome. All winding cobblestone streets and colorful buildings accented with beautiful shutters, popular Trastevere is easily among the most instagrammable spots in Rome. The delight of taking photos here is partially in wandering around to find small alleys and hidden corners that are incredibly beautiful, but here are a couple hints: head over to Via della Lungaretta and Vicolo della Torre for guaranteed Instagram-worthy shots. 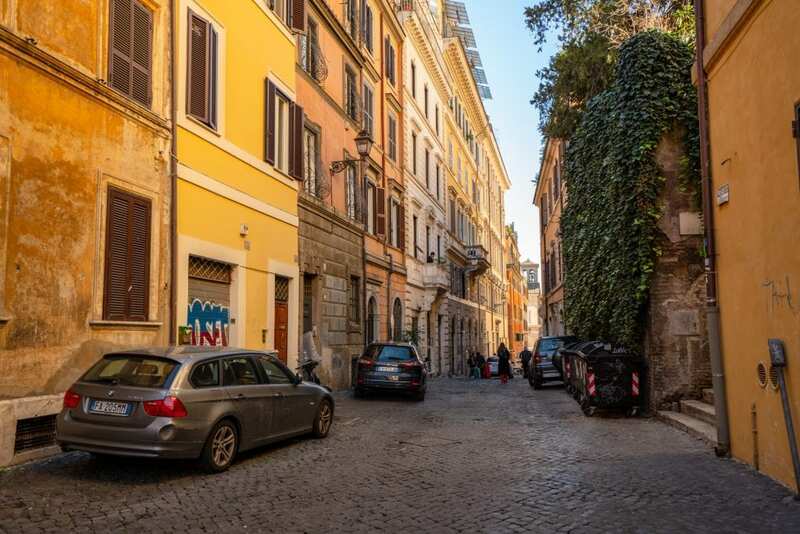 Tucked behind the Colosseum and often overlooked in favor of more popular neighborhoods like Trastevere, Monti absolutely deserves to be ranked among the most instagrammable spots in Rome. 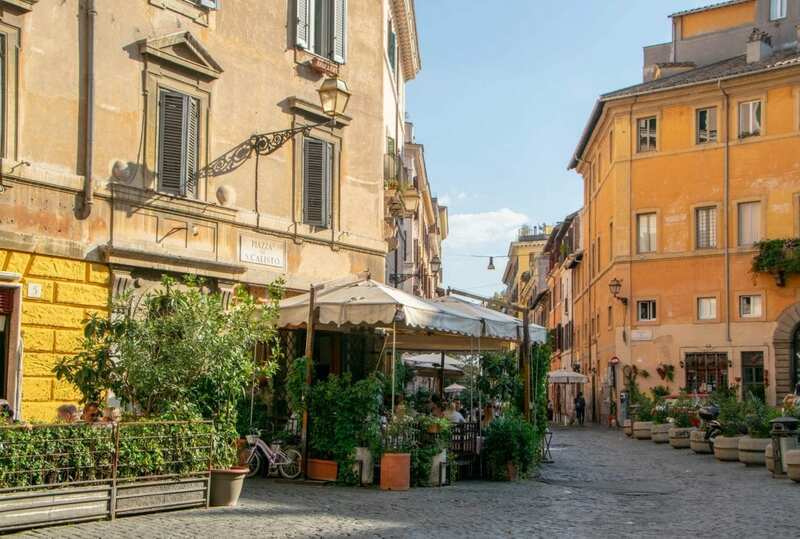 Popular with students and packed with tasty restaurants, narrow streets, and instagram-worthy boutiques, definitely add a wander through Monti to your list of photogenic spots in Rome–lovely Via de Ciancaleoni is a great starting place! 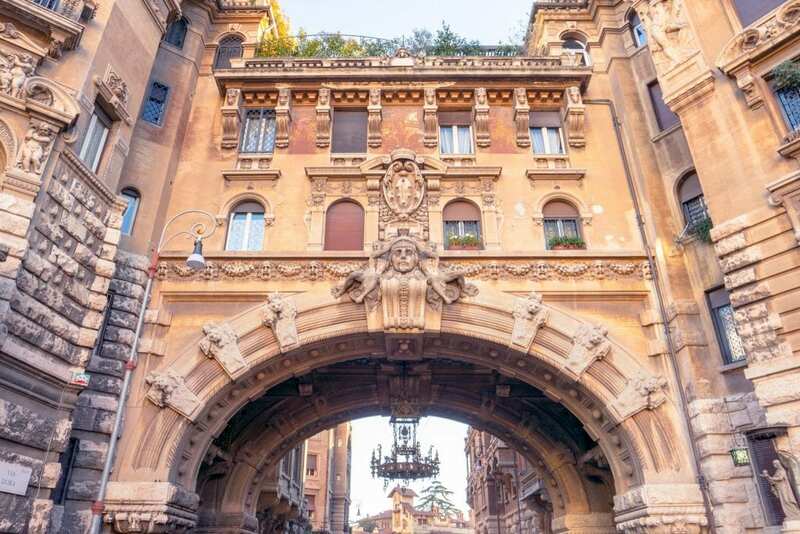 Rome’s most whimsical neighborhood is home to over-the-top fantastical architecture and features unforgettable details like a chandelier that hangs over a road and a fountain dotted with sculptures of frogs–and what could be more Instagrammable than a dash (or six) of whimsy? The earlier you get there, the better. 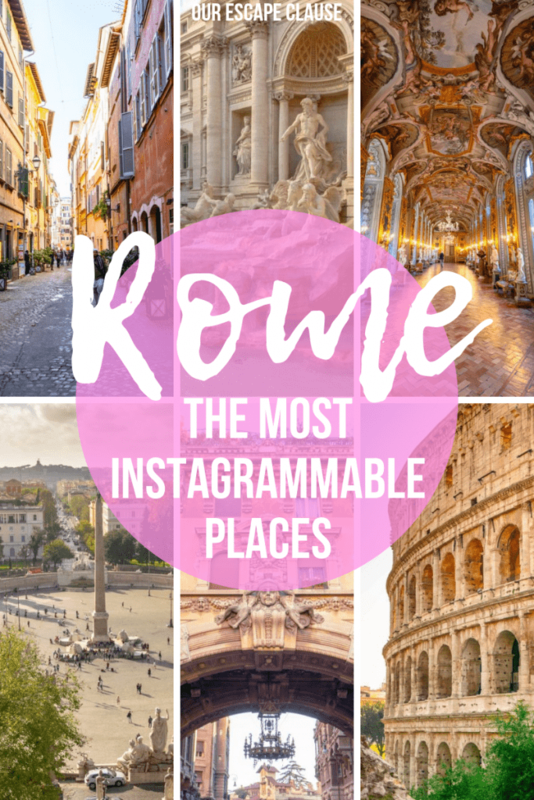 There’s no getting around it: many of the most instagrammable places in Rome are incredibly popular, and therefore incredibly crowded. Show up early–and by early I mean dawn–to have the best chance to photograph these places without the crowds. If you’re very dedicated to photography and don’t mind bundling up a bit, you can also avoid the worst of the crowds by visiting Rome in the off season! Gelato can improve just about any photo during summer in Rome. Want to add a splash of color to one of your Rome instagram shots? Gelato always does the trick! Use bikes & cars to your advantage. 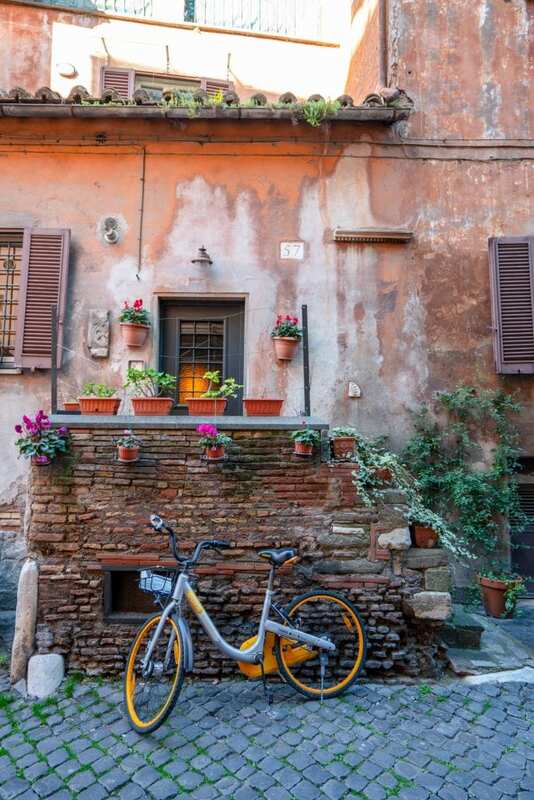 Bikes, vespas, and cars will often be parked on Rome’s narrow and most photogenic streets. Try to work with them if you can–I’m consistently surprised by what they can add to a shot. Graffiti is an unfortunate reality of photographing Rome. 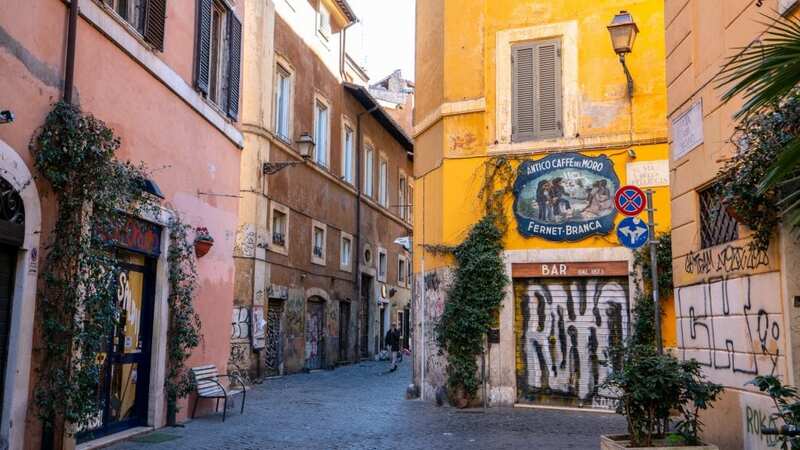 Angles and choosing the right photo locations can help, but Rome definitely has more than its fair share of graffiti, so be prepared to work around it when grabbing Instagram photos in Rome. Please, please, please be respectful. I can’t state this enough. 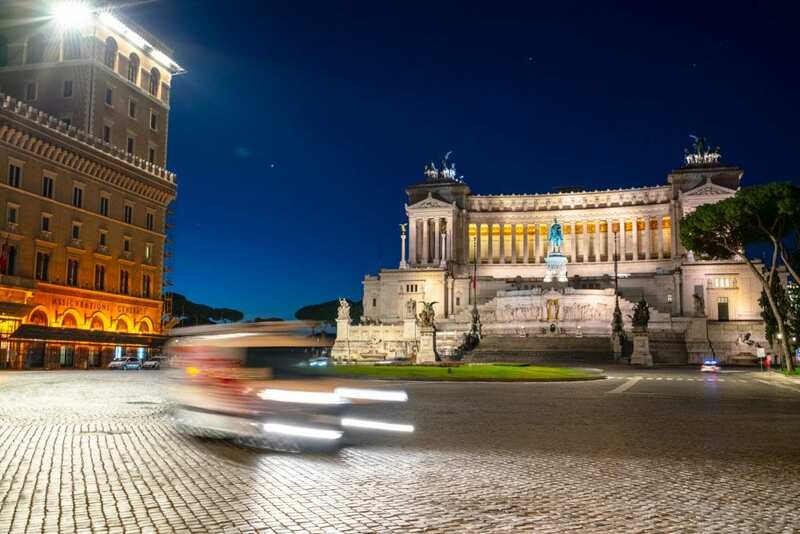 Rome is an ancient, enduring, and ridiculously photogenic city–but it’s also a modern and functioning one, where nearly 3 million people go about their daily lives. In a world of Instagram, inexpensive DSLR and mirrorless cameras, and excellent cameras on smartphones, it’s no surprise that constant photo taking can become a bit of a contentious topic–everywhere you go, it seems that more people are taking more photos than ever before. Be respectful of that when photographing Instagrammable spots in Rome–don’t climb on buildings, monuments, or vehicles (just why? ), don’t photograph people who don’t want to be photographed, and generally act with manners. That goes for your fellow visitors and photographers, too–be polite, and don’t hog spots if you see other people waiting. In other words, just be a reasonable person. It’s not that hard, and we’ll all be better off for it.